G5 twin tank commercial slushie machine 2 x 5 Litres by Sencotel. INCLUDES A 1,000 SLUSH DRINKS BUNDLE. 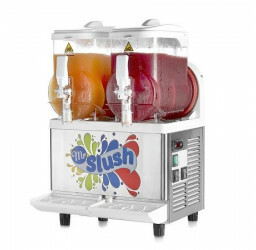 Robust and reliable, Sencotel slush machines are global leaders in slush technology. Drink capacity of 10Ltrs (approx 45 200ml slushies), the GB is a useful model if space if counter space depth is tight or you expect a lower demand of sales. 12 Months onsite parts and labour warranty. You may wish to consider our best selling machine, the 2x10Ltr Sencotel our best selling model. Next working day delivery if ordered by 12.30pm.